Time for our January Tic Tac Toe Challenge over at The House That Stamps Built. Choose three items (across, down, or diagonally) to include on your creation, then come by the blog and link it up! 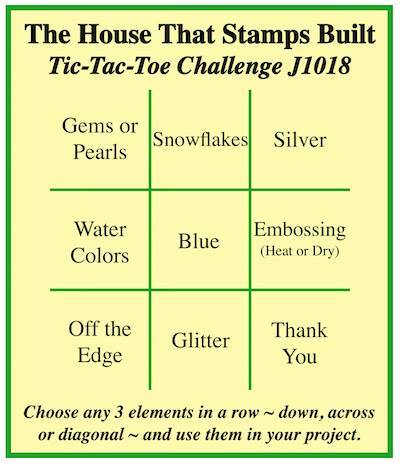 I chose to make a mini easel card using Pearls, Blue, and Thank You as my theme, and showcasing the Thanks a latte' stamps from Repeat Impressions. What a gorgeous easel card, like the Victorian look, all the details are stunning! Super easel card, great shape and some really lovely dies and flowers. Nice job on the challenge! Cute easel card! Love this cute card, such pretty details and wonderful design. A delightful feminine creation, many thanks for joining us again at Allsorts challenge. I really like the shape of this unique and lovely easel card! The rosettes are so pretty and I love the teapot too! What a wonderful way to say thanks to someone!! Just Beautiful, love how you paper pieced part of the mug, and such a pretty doily behind with the pearl accenting!! Gorgeous!! Great color scheme and I LOVE the pattern on the coffee cup; so fun!!! Hope you are feeling better soon. I haven't made an easel card in so long and when I saw this it knocked my socks off...this is sunningly gorgeous! Oh, I really like stand up cards! This is such a pretty one. Looks like you are all ready for high tea!